When and how often should women get mammograms? 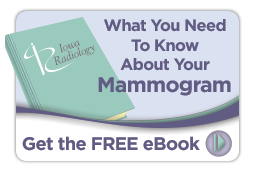 Iowa Radiology follows the guidelines set out by the American College of Radiology (ACR), which recommends beginning annual mammography screening at age 40. Research has shown that this screening regimen is associated with saving the most lives and the greatest number of life years. The ACR does not set an upper age limit for mammography, advising women to continue screening for as long as they are healthy and wish to remain so. What risks are involved with mammography? The primary risk associated with mammography is that of obtaining an incorrect result, either by failing to identify breast cancer that is present (false negative) or by identifying normal tissue as potentially cancerous (false positive). Susan G Komen reports that mammography correctly identifies 87% of breast cancers and results in false positive findings 7–12% of the time. The organization notes, however, that radiologists who read a lot of mammograms are better able to correctly identify breast cancers than those who do not. Additionally, the use of 3-D mammography has been shown to reduce both false positive and false negative findings. This is especially true for women with heterogeneously dense breasts, which can make cancer harder to spot on a mammogram. So, getting your mammogram from a provider who performs them regularly and uses modern 3-D equipment can reduce your risk of getting a false result. Modern mammography uses very little radiation. Radiation is part of our natural world and so cannot be avoided entirely. It’s estimated that people in the U.S. receive an average 3 mSv of radiation per year from natural sources such as sunlight and radon, with people living at higher altitudes receiving about 50% more than this. By comparison, a modern mammogram delivers a radiation dose of only about 0.4 mSv—the equivalent of what the average American receives from the natural environment over the course of 7 weeks. 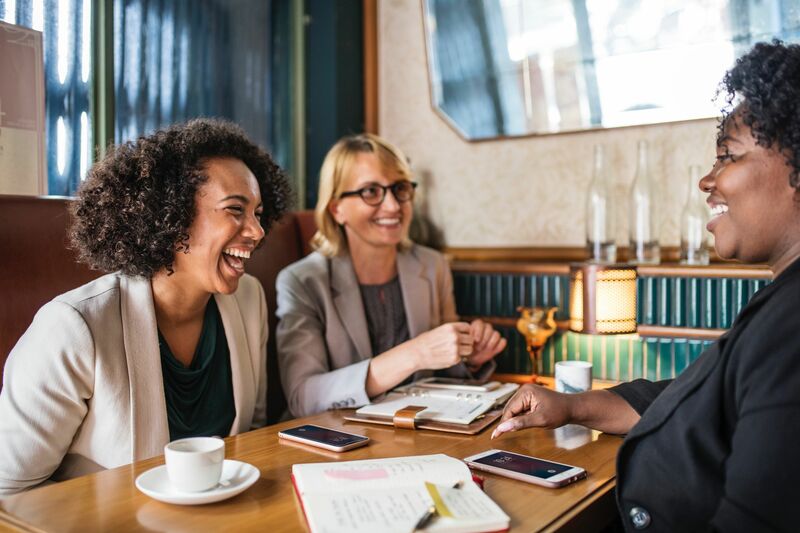 Susan G Komen reports that the small amount of radiation used in mammography have little, if any, effect on cancer risk and that the benefits of mammography screening outweigh the risks of radiation exposure. 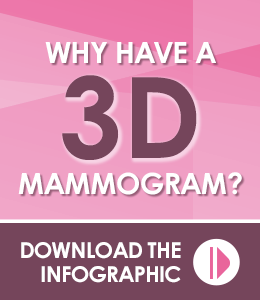 What is the difference between a 2-D and 3-D mammogram? In a 2-D mammogram, two views (vertical and horizontal) are taken of each breast. 3-D mammography, also known as breast tomosynthesis, uses a series of images taken as the machine moves in an arc over the breast, which are digitally combined to create a 3-D image that the radiologist can manipulate and zoom in on to better visualize areas of interest. This allows the radiologist to “see around” structures that may otherwise obscure problem areas. One large study published in JAMA found that the addition of tomosynthesis to mammography was associated with a 41% increase in detection of invasive breast cancer. What should I expect at a mammography appointment? When you schedule your mammogram, you’ll be asked to come to your appointment without deodorant, lotions, or other products under your arms or around your breasts, as these can obscure mammography images. After you arrive, you’ll be given a gown and asked to disrobe from the waist up. For your convenience, it’s best to wear a comfortable 2-piece outfit on this day. The technologist will situate each breast between two imaging plates, which will compress the breast in order to obtain the clearest possible images. Some women describe this as mildly uncomfortable, while others experience it as painful. To minimize discomfort, try to schedule your appointment within the first two weeks of your menstrual cycle, when your breasts are least likely to be tender or swollen. If you experience pain, be sure to let your technologist know so they can take steps to make your exam as comfortable as possible. If I get a call back after my mammogram, does it mean I have breast cancer? A callback after a screening mammogram does not mean that you have breast cancer. Rather, it indicates that the radiologist has found something in your mammography images that warrants further investigation. In most cases, this is not breast cancer. As stated above, 7–12% of mammograms return false positive results. Of women called back for further testing after a screening mammogram, fewer than 1 in 10 are diagnosed with breast cancer. Iowa Radiology uses only modern 3-D mammography in our clinics, and our staff includes fellowship-trained breast imaging specialists with years of experience reading mammograms. 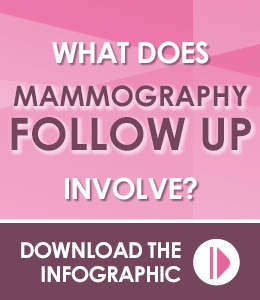 Click any of the images below for more information about mammography and follow up. "ACR Position Statement on Screening Mammography and Health Care Coverage." American College of Radiology, 5 Oct 2016. Accessed 27 June 2018. "Accuracy of Mammograms." Susan G Komen, 8 Aug 2017. Accessed 27 June 2018. "Effectiveness of Digital Breast Tomosynthesis Compared With Digital Mammography." JAMA Oncology. vol. 2, no. 6, 2016, pp. 737–743. "Breast Cancer Screening Using Tomosynthesis and Digital Mammography in Dense and Nondense Breasts." JAMA. vol. 315, no. 16, 2017, pp. 1784-1786. "Radiation Dose in X-Ray and CT Exams." Radiologyinfo.org. Radiological Society of North America, 20 April 2018. Accessed 27 June 2018. "Radiation Exposure." Susan G Komen, 17 Oct 2017. Accessed 27 June 2018. "Breast Cancer Screening Using Tomosynthesis in Combination With Digital Mammography." JAMA. vol. 311, no. 24, 2014, pp. 2499-2507. "Getting Called Back After a Mammogram." Cancer.org. American Cancer Society, 9 Oct 2017. Accessed 27 June 2018.